2016 Bookish Resolution Challenge: Learn 12 New Recipes. I honestly DID try my best to follow the instructions exactly this time. As I'd stated in my previous recipe post, I'm a rebellious cook. Most people are supposed to understand the basics before they start experimenting and making up their own recipes. I just dive right in and pretend I'm at that level, when in reality, I really SHOULD NOT make it up as I go along until I know what I'm doing. Hint: I never know what I'm doing. 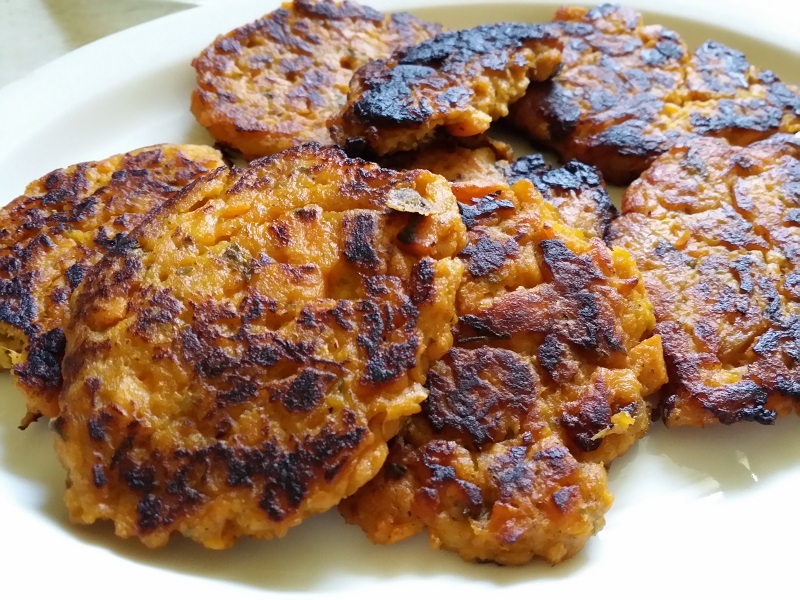 I came across this recipe while browsing some recipe recommendation e-mails I get through various websites. I like sweet potatoes and this one sounded extremely simple, so I decided to give it a try. To be totally honest, I've had better sweet potato dishes. But at this point, I'm not entirely certain I know if I screwed up, or if the recipe was so simple that it was kind of bland. Hint: I was probably the one who screwed up. For one, I decided to take a few liberties with this recipe. Once again, I made some slight changes to suit my lazy needs. The recipe calls for white pepper, but I chose to use black instead. The recipe calls for fresh parsley, but we have some manufactured dry stuff. The recipe also calls for shallots--I was too lazy to go shopping. Otherwise, everything else seemed to work out just fine. 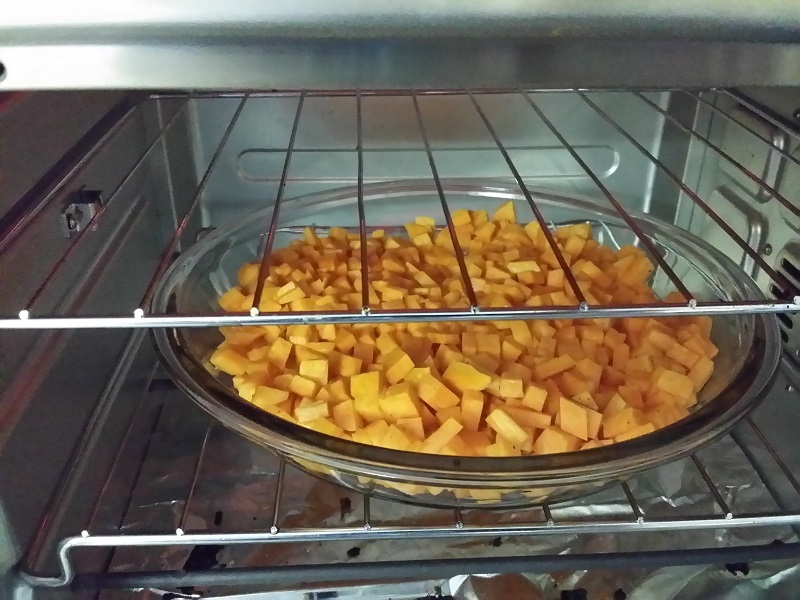 As the recipe above notes, roasting your sweet potato in an oven brings out the flavor of the sweet potato better. But if your preference is boiling, that will work as well. 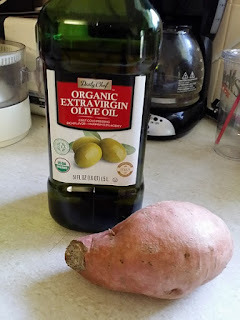 So after peeling and chopping up my one sweet potato, I drizzled some olive oil over the diced chunks, added a little bit of salt and pepper, then mixed it up a little bit. 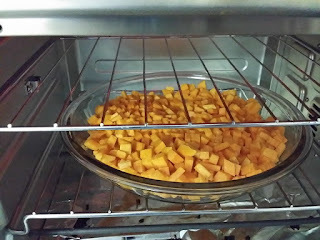 As stated in the recipe, I proceeded to roast the sweet potato at 400°F for 30 minutes. But as we had just gotten a brand new oven that's a bit tricky, I decided to tone down the heat a little bit and set it at 350°F for 25 minutes--this thing will burn toast after two minutes if you're not careful. 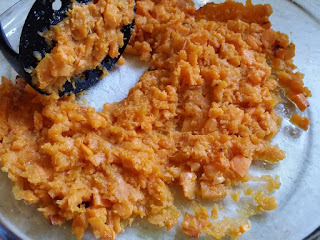 Unfortunately, even THAT seemed to be too much for the sweet potato. 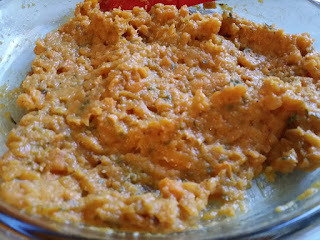 While my sweet potato chunks didn't burn, they DID dry out a little bit, which made mashing them a bit harder to do. Also, I'm certain that the diced chunks might have been too small. ... and came up with something like this. It looks really nasty at this point, like unidentified puree of some kind. But what I did was begin mashing the potato chunks, then adding the parsley, eggs, more salt, more pepper... And I kept right on mashing. I have to admit, it smelled pretty good at this point. It just looked a little... weird? 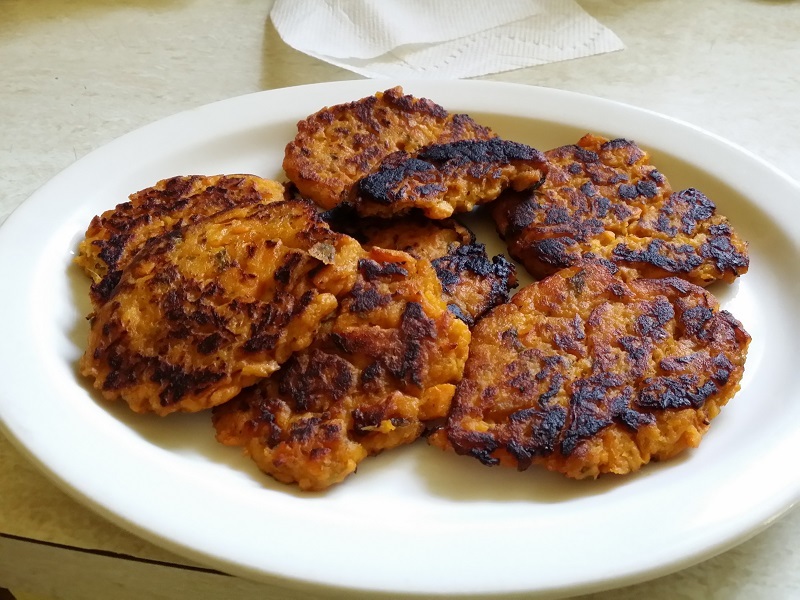 And they didn't form 4-inch round patties very well either because everything was so goopy. But once fried up, the final results didn't look too bad, really. This is Recipe #2 this year (It's already May and I need to catch up so, SO badly! ), and this attempt really wasn't all that bad. It's not the prettiest looking dish in the world, but it really, really wasn't all that bad. I DID skip the shallots and it made me wonder if the patties would have come out a little bit better with them. But in reality, they tasted just fine. I just felt like they might be missing something--like a zing of taste or something. I'm not sure. My mom seemed to really like them, but then again she likes anything she doesn't have to cook since she's our main chef at home. And after coming back to them and reheating them hours later, they were actually not so bad and had more of a taste to it. Try white pepper instead of black. Set the oven for 20 minutes. I'm thinking maybe I could try some other type of flavoring root component thingy. I asked my mom if minced garlic would work, but she seems doubtful. In fact, she thinks that maybe I could stand to add a little bit more salt. That maybe I was a bit too conservative with the salt, because I'm paranoid about too much salt. I'd much rather add more pepper, but I know I can't sub one for the other. I guess we'll just have to let the cooking experiments commence. Heck, it took me three tries to get the Cheesy Corn Casserole perfected to YUM!